DLC season pass lets players nab Uncharted 3's future multiplayer packs at a discount. In a move reminiscent of how Microsoft is handling the upcoming DLC for Gears of War 3, Sony recently announced a DLC season pass for Uncharted 3: Drake's Deception, the next entry into the action-adventure series. Titled "The Fortune Hunters' Club", the season pass enables owners to nab the first four multiplayer map packs along with the first three multiplayer skin packs for the upcoming game. Currently Sony is charging $24.99 USD for the season pass, estimating that without it, the total cost of the DLC packs will be around $45.00. The season pass also includes a Fortune Hunter's Club theme and will automatically notify you when new Uncharted DLC arrives at the PlayStation Store. 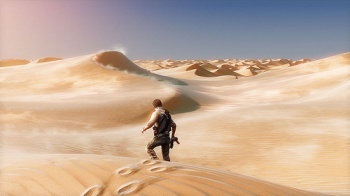 The first DLC is planned to arrive shortly after Uncharted 3 releases November 1st, 2011 in North America.